Note: Steve Bissette and I are teaching a course in contemporary comics history (Survey of the Drawn Story II, as it’s properly known). Our students are required to submit an essay, in blog form, on an aspect of contemporary comics history. They are restricted to the period of 1969 – present. Today’s essay is by Jesse DuRona. Enjoy! In 1978, a little comic strip appeared that changed the world. It is about a fat, lazy, irritable orange feline who loves lasagna and pestering his loyal canine companion. This comic strip, of course, is Garfield. Garfield is written and illustrated by Jim Davis, who originally created him to be marketable. His original strip, Gnorm Gnat, was published in Indiana in the 1970s. Davis had originally wanted to syndicate Gnorm Gnat, but was told that bugs are not funny (which can be contested, given the success of Gary Larson’s The Far Side). Never the less, Davis killed off Gnorm Gnat (literally, via a stomping foot) and gave life to Garfield. Davis’ ploy to create a more popular character paid off in full, as it lead him to create one of the most popular comic strip characters in American culture. Garfield has gained wild commercial success, responsible for everything from mugs to dolls that sick onto car windows. The 80s and 90s were when Garfield enjoyed most of its popularity. Most notable are the Emmy award-winning television specials, such as Here Comes Garfield, Garfield in Paradise, and A Garfield Christmas Special. Following the success of these shorts came Garfield and Friends, which ran from 1988 to 1994. Garfield’s popularity can also be measured by how often it is parodied. 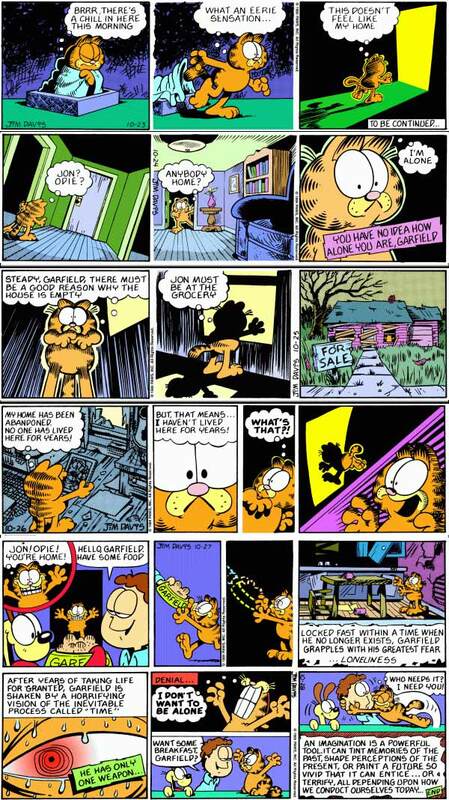 Most notable is Garfield Minus Garfield, a strip created in 2008 by Dan Walsh. This strip takes the series in dark and ironically hilarious turn. Walsh’s comics are reprints of past and present Garfield strips with Garfield himself removed from the strip using digital manipulation. The result is an entirely new take on the now solitary Jon Arbuckle. Poor Jon. Without his faithful feline companion, he is reduced to a schizophrenic manic-depressive, albeit a hilarious one. Jim Davis himself has praised the comic, and even sanctioned its publication. The book shows both the original and altered comics side by side. There are many other parodies of Garfield that can be found on the web. One such parody is Lasagna Cat, which takes older strips and makes live-action videos out of them. While funny, they take a negative view of Jim Davis himself, insinuating that he has no talent. One of the more interesting takes on Garfield was done by Jim Davis himself. In October of 1989, Davis wrote a 6-strip story arch in which Garfield discovers that Jon and Odie are missing, and their house has been abandoned. With no friends left, Garfield has to come to terms with his greatest fear: loneliness. Some have speculated that, in this strip, Garfield has died and his ghost was wandering the house. Davis himself has said this is not the case, and that he simply wanted to do something legitimately scary for Halloween. It is certainly a more disturbing Halloween tale than even the 1985 television special Garfield in Disguise, which was also scary, but targeted to a younger audience. Garfield, while it is an astounding commercial success, is not often given the credit it deserves. It has lost a lot of its popularity over the years, and attempts to revitalize the franchise have gone largely unnoticed. In 2004, the first full length Garfield movie was released, though it was met with critical disdain. It was followed by a sequel, Garfield: A Tale of Two Kitties, in 2006. Even Bill Murray’s excellent voice acting could not save these films from their negative reviews. The Garfield Show, a CGI rendered series in 2008, has not helped matters either. The series lacks that organic feel that Davis’ art brings to the characters, and many of the episodes are based off those from the wildly popular original series. As for the strip itself, which is still the most relevant thing about Garfiled, it remains the most popular syndicated comic strip in the world. It has over 260 million readers worldwide. Jim Davis, now in his 60s, still does all the composition himself, though he does have a staff of over 50 people to help with the heavy lifting, such as the TV show. On a personal note, I am a huge fan of Garfield. I grew up on the series, and it is one of the things that inspired me to pursue cartooning as a profession. Garfield, despite being rough around the edges, is a very honest and likable character. We can relate to him, and we admire him because he is true to his nature and is unapologetic about it. In some ways we wish we could be like him, carefree and happy. It is because of this that Garfield will continue to be successful for many years to come. This entry was posted in Historic and tagged comic strips, garfield, Garfield Minus Garfield, Gnorm Gnat, Jesse DuRona, Jim Davis, Lasagna Cat. Bookmark the permalink. Sorry. to say but Garfield is the most unfunny comics in the newspaper today. Jim Davis’s older comic were genuinely funny, but the stuff he does today is just stupid and boring. He has ran out of ideas and he should just quit. I don’t know why he thinks what he does is funny. For instance a few weeks ago the sunday strip was jon and garfield staring at the each other for the entire strip and the last panel jon blinked and garfield said, “You lose.” Are you kidding me? that’s supposed to be funny? He just needs to learn that it’s time to quit. Hey, he still does funny strips. Especially ones nowadays, I think. Jim Davis hasn’t run out of ideas, and now he has a whole team of people who have hilarious ideas. I’ve been reading Garfield my whole life and still think it’s funny! Don’t ask but my local paper only delivers once a week and they don’t have comics in the paper. But luckily I can read every strip ever made on the Garfield website! It’s the best comic strip ever.